I really was never a brown ink kind of person. It is not until recently that I’ve come into the fold so to speak, but even so, I really dislike brown inks that lean red, green, or yellow. I want an ink that is a dark brown that maybe leans a bit black or gray. 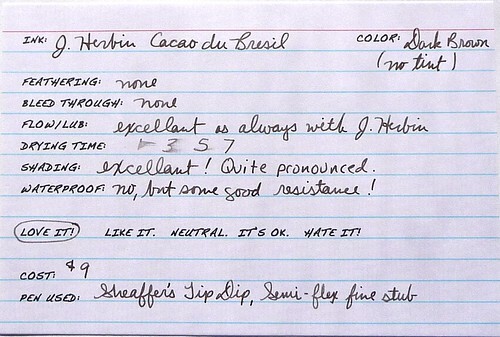 Thus, it was love at first sight for JH Cacao Du Bresil. It’s gray yet brown or rather brown yet gray! I’d describe this color as a medium-darkish brown ink that heavily leans gray. It really needs a wet writer to strut its stuff. In a dry writer it will simple look light gray. I subscribe to your blog’s feed and I was wondering if you would like to exchange links between our blogs? Please feel free to direct message me at @goldspotpens on twitter or leave a comment on our blog if you need to contact me.